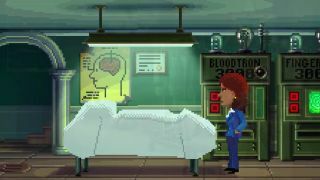 A new trailer for Thimbleweed Park, the deliciously Lucasarts-like retro-adventure being developed by Maniac Mansion creators Ron Gilbert and Gary Winnick, has made its way to the 'tubes. And I am here to tell you that it is good. The obvious X-Files vibe, leavened with a hint of Naked Gun, is right up my alley too. Thimbleweed Park is slated for release late this year. Find out more at thimbleweedpark.com.